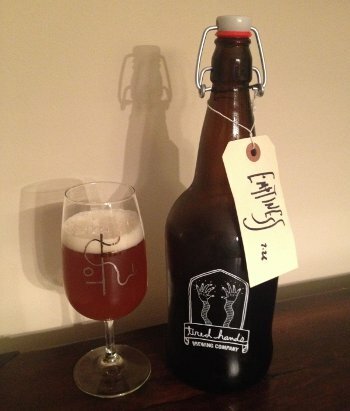 Beer Nerd Details: 7% ABV from a growler (1L swingtop). Drank out of a flute glass on 7/26/14, growler filled earlier that day. I had this on tap last week too (it kicked while I was sitting there finishing up a glass), and I found it slightly better than in the growler (but that's my general feeling with growlers). Up next in the Emptiness series are The Emptiness is Not Eternal bottles. Jean sez the bottle conditioned version is better than the one that was on tap during the Second Anniversary, which makes me wonder if I Am The Emptiness would similarly improve if bottled... Anyway, after that one comes You Are The Emptiness, which is made with peaches, and therefore represents some sort of beer nerd singularity that will draw quite a crowd when released. 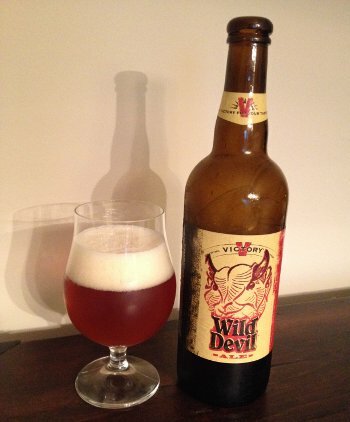 Beer Nerd Details: 6.7% ABV bottled (750 ml caged and corked). Drank out of a tulip glass on 7/26/14. 2014 vintage. I am curious to see how this sort of thing would last over time, and it seems like a good sort of beer to have laying around, just in case. I meant to grab myself a regular HopDevil to compare, but it turns out that this was not necessary, as the Brett, while mild, was immediately noticeable. I'm long overdue for a trip to the brewery. It used to be a regular stop, but I've fallen out of the habit and have been patronizing some other locals in its place (which has its own benefits, to be sure!). Evil Twin Imperial Biscotti Break - I've actually had this a few times before, and it's really nice, especially if you like coffee. As I'm pretty much ambivalent to coffee, I thought this was fine, if not the best evar, though it seemed to go over really well. This was another favorite of the night amongst the beer club peeps, but I'll go B+, but only because my coffee feelings are well documented (could easily be higher for most other folks). Blue Point (Sour) Cherry Imperial Stout - I have to admit that I'm not the biggest sour stout fan out there, but this worked well enough, with that rich malt and sour twang, maybe even a hint of that cherry. 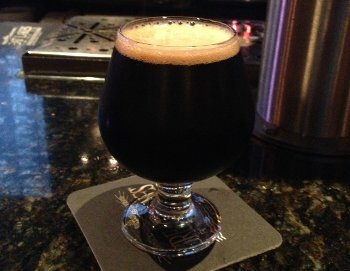 A few of us tried blending this beer with the Imperial Biscotti Stout, just to see what would happen, but it didn't turn out particularly great. This beer by itself is better, but still around a B level beer for me. So there you have it. August may be a weird month in terms of beer club, but I'm sure we'll work something out. In any case, stay tuned for some moar local awesomeness this week on Kaedrin. Dock Street has been around for forever and has had its ups and downs, but this is a beer that I've had a few times in the past few years, and it's one of my favorite local beers to revisit. Dock Street is tiny, so naturally these bottles don't come around that often, but it flows on tap throughout the winter months and is possibly the best local imperial stout that is regularly available (notwithstanding various one offs from the likes of Tired Hands or Tröegs - though both of those beers did return, you never know if you'll see them again). Are those fighting words? Maybe a bunch of Shackamaximum fans will come out of the woodwork and drown me in hateful scorn, but I'm doubting it. Beer Nerd Details: 9.5% ABV bottled (750 ml). Drank out of a snifter on 7/25/14. Bottled 1/30/13. 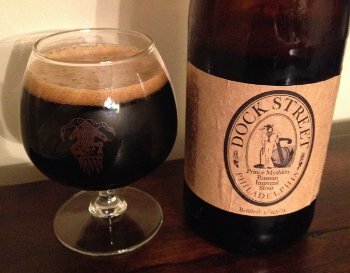 If you're ever in the Philly area in the winter, it's worth stopping in at Dock Street for a glass of this and some solid pizza (sorry, I've never had anything else there, but the pizza is good). Here's to hoping they age this in barrels again sometime soon (and that they let it carbonate this time). It used to be that you'd see the occasional Bourbon barrel aged beer. Everyone would lose their minds, and they'd fly off shelves, and it was all well and good. I, for one, welcomed our bourbon barrel overlords, but the past few years have seen brewers diversifying their barrel aged offerings. You've got rum barrels, apple brandy barrels, and wine barrels galore. Enter the dreaded tequila barrel. 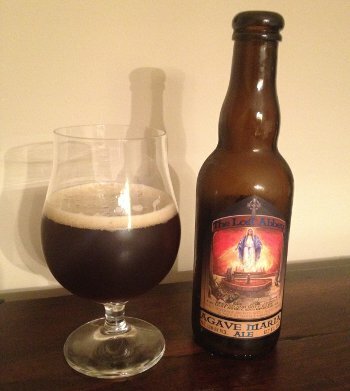 Lost Abbey brewer Tomme Arthur even decided to double down on this offering, brewing the base beer with Agave syrup. The fine folks over at Lost Abbey run a pretty tight Keebler tree, so despite some rightfully dubious responses, I figured I'd drop some coin on a bottle of this stuff and see what the deal is. In short, while not "worse than undrinkable", that's also setting the bar too low. I'd rather drink this than most macro slop, and it is a unique, interesting beer, but it's not something I'd go out of my way for again. Beer Nerd Details: 13.5% ABV bottled (375 ml caged and corked). Drank out of a tulip glass on 7/19/14. Vintage 2014A. 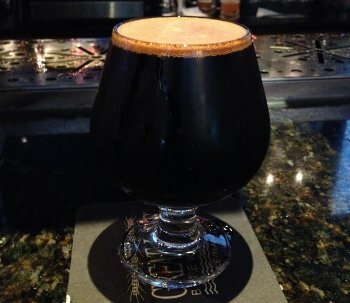 I'm all for barrel diversification, but you know what, you should probably also just throw some Serpent's Stout in Bourbon Barrels, because that would be killer. Yeah, Deliverance has BBA Serpent's Stout in the blend, but I'm sure the straight up juice would be even better. Ah well, I'll just stop pretending like I actually know better than people who do this for a living now. I'm a moron. It's been over a year, but I'm still mining some black gold out of Voodoo's Barrel Room Collection. 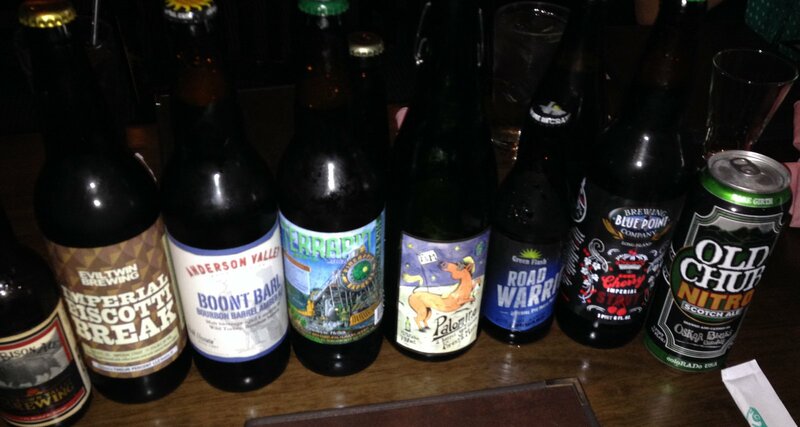 It's been a generally successful venture, and I'm happy I waited in line for the privilege of buying these beers. Sidebar! According to wikipedia, there are many things that "black gold" could be referring to. The obvious one, for all you hillbillies out there, is crude oil (Texas tea!). Along similar and unsurprising lines would be coal. A little more unexpected: black pepper. It turns out that at one time, this was prized, rare, and compact enough to be universally accepted as payment (a commodity money). More unexpected would be Marmite, that salty yeast extract that's used as a food spread in the Anglosphere. This one seems to be a relatively new coinage, linked to a recent shortage (dubbed the Marmageddon). Finally, we have coffee, which is a little dubious, but you all know my feelings on coffee at this point. Beer Nerd Details: 13.5% ABV bottled (12 oz. Blue Wax). Drank out of a snifter on 7/18/14. 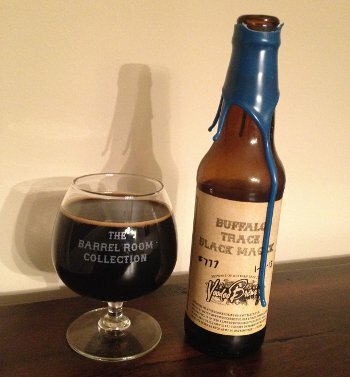 Bottle #777. Bottled 1-18-13. Alas, my Barrel Room Collection stash is dwindling, only a pair Lairds Apple Brandy barrel aged stouts left. Look for those reviews soon enough. It looks like their next barrel room collection release is TBD, but they posted a new picture on their site. Alas, the barrels are not labeled. And if the last couple batches were any indication, these things sit for quite a while in the barrel before being released. Still, we are coming up on about a year since the last release, so there is that... Here's to hoping they have another Philly release. Otherwise, a 5 hour drive might be a bit much to undertake. 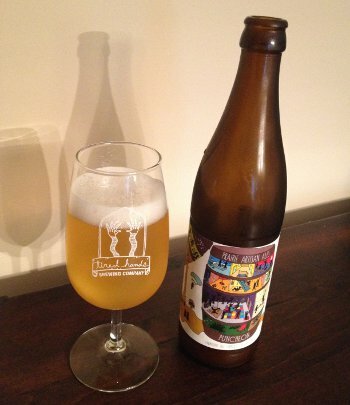 Prairie Puncheon - Pours a hazy straw yellow color with ample carbonation and a finger or two of fluffy white head. Smells fantastic, beautiful funky, musty aroma, fruity, almost vinous, spicy, maybe even hints of oak. The taste seems more substantial than the nose was indicating, sweet, but with enough earthy funk to counter that, and indeed, that earthy, mineral character is much more prominent here than in the nose. Lots of funky stuff going on in the middle and finish as well, with some of that fruitiness coming out, and a little spice too. Not sour, but could perhaps have gone that way (and would possibly be better for it, *hint*), though it's still tasty in its own right. As it warms, it gets closer to lemon territory, but again, not sour... Mouthfeel is well carbonated, medium bodied, a little spice, and just a bit of a kick on the back end from that funk. Overall, this is a rock solid Brett dosed saison. It's borderline, but I'm feeling generous, so an A- it is. Beer Nerd Details: 8.5% ABV bottled (500 ml). Drank out of a flute glass on 7/18/14. So I'm pretty well looking forward to trying more Prairie ales, though I don't really have any on deck right now either. Someday, I may get off my arse and start trading for the likes of Bomb!, but that's not going to be anytime soon. If you're going to try and decode Tired Hands beer names, one place to start would be familiarizing yourself with Kurt Vonnegut. This reference, at least, is a straightforward one from Vonnegut's most famous novel, Slaughterhouse-Five. It's a refrain that occurs frequently throughout the novel (like, over 100 times), usually associated with death or mortality in some way. Tired Hands So It Goes... - Pours a really rather pretty dark orange amber color with half a finger of white head that sticks around a bit. It looks like a lighter, brighter Flanders Red. Smells of vinous fruit, cherries, oak, and a nice acetic sour twang. The taste hits similar notes, vinous fruit and cherries are there, but not as strongly as in the nose. It's not as sweet as I typically expect from a beer like this, but it's not really bitter at all either. The oak is doing its thing throughout, and there's a nice puckering sourness that emerges in the middle and lasts through the finish. 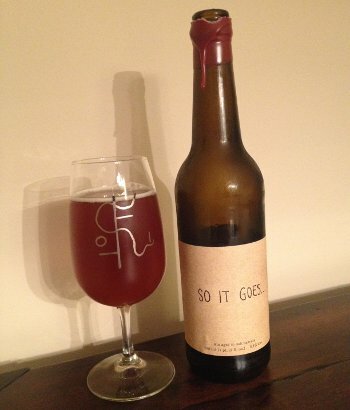 Mouthfeel is well carbonated, and on the lighter end of medium bodied (lighter than expected). Plenty of acidity to go along with that sourness, but it's not overwhelming or anything. Overall, it's becoming impossible to grade all these Tired Hands sours, because they've really been killing it with their recent sours (particularly the Emptiness series beers and those Parageusia beers). This is an A-, but on the lower end of their bottled sours. Beer Nerd Details: 8.3% ABV bottled (500 ml waxed cap). Drank out of a flute on 7/12/14. Mark your calendars beer nerds, Parageusia1 release on Sunday. Totally worth the effort, and it looks like it'll be a nice day. See you there. The Lost Abbey always has fantastic events during Philly Beer Week, but due to a variety of factors (general listlessness, apathy, and the fact that I have a job), I can never seem to get there. So I missed out on coveted pours of Cuvee de Tomme and Duck Duck Gooze, but managed to snag a few interesting bottles, including this Framboise De Amarosa. 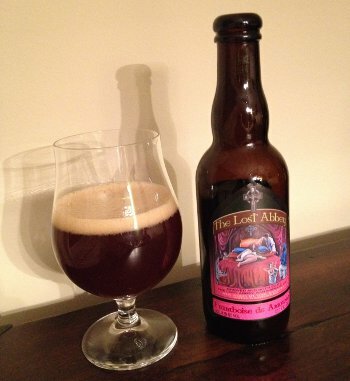 The base for this beer is Lost Abbey's standard Lost & Found ale, a dubbel brewed with raisins. Take that, add in an ample dose of raspberries, and age in oak (Tomme sez it's a blend of 9 and 12 month old beer), and you've got something that sounds rather spectacular. It's named after Amorosa, a biblical reference to a courtesan... which reminds me of Cantillon's rather risque label on Rosé De Gambrinus. Are raspberries associated with loose women, or is this just a cheeky coincidence? Beer Nerd Details: 8.5% ABV bottled (375 ml caged and corked). Drank out of a tulip glass on 7/11/14. Vintage 2014 A. 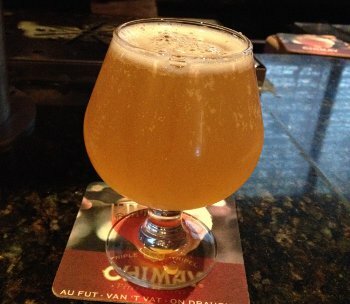 Every year, a local drinkery puts together a killer taplist on the 4th of July, and for the past two, I've tried to make it over there. Of course, it helps that they're pouring stuff like Hill Farmstead (insert stupid image of Wolverine pining after beer here), and this year there were 2 that I had not managed to wrangle before. In addition, I snagged my first Funky Buddha beer, and a little midwest coffee stout. Let's just say that it was a good day. Beer Nerd Details: ? 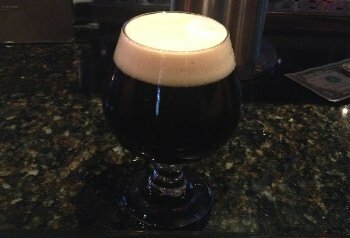 ?% ABV on tap (10 oz). Drank out of a snifter on 7/4/14. Beer Nerd Details: 6% ABV on tap (10 oz). Drank out of a snifter on 7/4/14. So I know what you're thinking, two Hill Farmstead beers and no A level ratings? Well fear not, Abner, Susan, and Arthur were also on tap and are all as fantastic as ever. But after the above two, I jumped ship for my first Funky Buddha beer. They're a Florida brewery that doesn't get much in the way of distribution, but Philly really is a wondertown in that respect, so a few kegs make their way up here from time to time. This offering was, by far, the weirdest thing I had all day. Beer Nerd Details: 6.5% ABV on tap (10 oz). Drank out of a snifter on 7/4/14. Beer Nerd Details: 10.5% ABV on tap (10 oz). Drank out of a snifter on 7/4/14. So this was a very good day. Lots of new, interesting beer, and some real, genuine classics that I'd had before but will always jump to try again (looking at you, Abner!) Already looking forward to next year's 4th of July celebration! Posting will probably be light this week, but never fear, we'll be talking great beer again in no time.